DaVinci Resolve includes sophisticated professional editing tools designed to handle a wide range of projects from scripted prime time dramas to fast paced stylized commercials and even multi camera productions. Editing tools are context sensitive, which means that DaVinci Resolve automatically knows how you want to trim based on the position of the mouse so you don’t have to waste time switching tools! You also get customizable keyboard shortcuts so you can edit quickly and move between applications with ease. DaVinci Resolve has the most advanced collaborative tools that let multiple people work together on the same timeline at the same time so you can finish faster and focus on your edit! Saving and managing media is a critical part of every project! 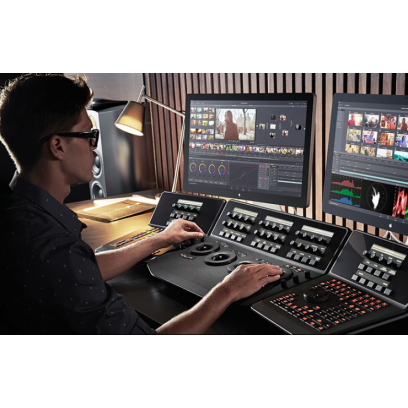 DaVinci Resolve features powerful media management tools specifically designed for editorial and color workflows. You can easily move, copy, consolidate, relink, and archive media, timelines or entire projects. DaVinci Resolve’s clone tool will back up your valuable camera files on location so you can copy camera files to multiple destinations with checksum validation for safekeeping while you’re still on set! DaVinci Resolve can also edit metadata, sync sound and prep footage for editing, color grading or visual effects. DaVinci Resolve helps you on local drives or over your network and, because it works with virtually every camera and video format, you don’t need to convert files to begin editing or grading! Whether you’re creating a master for TV release, a digital cinema package for theatrical distribution or finishing for delivery over the internet, DaVinci Resolve includes powerful delivery options for versioning, finishing and delivery at any resolution. You can export your media in a variety of formats with optional burn-ins, output EXR or DPX files for visual effects work and uncompressed 10 bit or ProRes files for editing in applications like Final Cut Pro X. Exporting can take advantage of remote rendering, using another Resolve on the network to render the job. DaVinci Resolve works from your camera originals so you always get the highest quality output. That means your finished master is a first generation graded copy of the original camera RAW files! DaVinci’s high quality image processing is so revolutionary it won an Emmy™ award for contributions to the television industry! All image processing is at the deepest 32 bit floating point and DaVinci Resolve uses a unique YRGB color space for grading. This allows you to adjust the luminance gain of your video without rebalancing the color of your whites, mids, or blacks. That means you won’t have to chase the correction you’re aiming for! 32 bit processing combined with YRGB color science gives you a dramatically wider color correction range, so you can generate looks that other systems simply cannot match! DaVinci Resolve simplifies the color management of multiple clips with different color spaces, allowing you to define individual source, timeline and output color spaces with incredible speed and accuracy. Now you have a complete end to end color managed pipeline that can use DaVinci Resolve’s color managed timelines and ACES 1.0 (Academy Color Encoding Specification) color for high end digital cinema workflows. Exchange projects with your favorite NLE software, send clips to VFX and motion graphics, and export projects directly to ProTools for professional mixing and sound design! DaVinci Resolve can share sequences and round trip projects with Final Cut Pro X, Media Composer, Premiere Pro and more! That means you can edit your project on any system, then using XML, AAF or EDL’s, you can link back to your full quality camera RAW files and finish in greater bit depth with DaVinci Resolve. You can also use AAF export to send a project to ProTools with discreet audio clips and a single layer video mix down for audio finishing. DaVinci Resolve lets you work with and integrates with dozens of other software tools so you can focus on getting your job done.